A nationally (and internationally) recognized direct marketing company providing printing, direct mail, database management and digital marketing solutions to a wide range of consumer, business-to-business and fundraising marketers was seeking to refinance its existing debt and support working capital. Due to a timing issue related to some pending legal decisions, fewer cases in another division known as Class Action Claims Administration, and the loss of two customers due to reasons unrelated to the Company’s performance, the Company decided to find a new lender that understood its business and could support its growth. The Company retained Concord as its exclusive financial advisor to arrange its debt financing and identify a Bank that understood the company’s business and objectives. 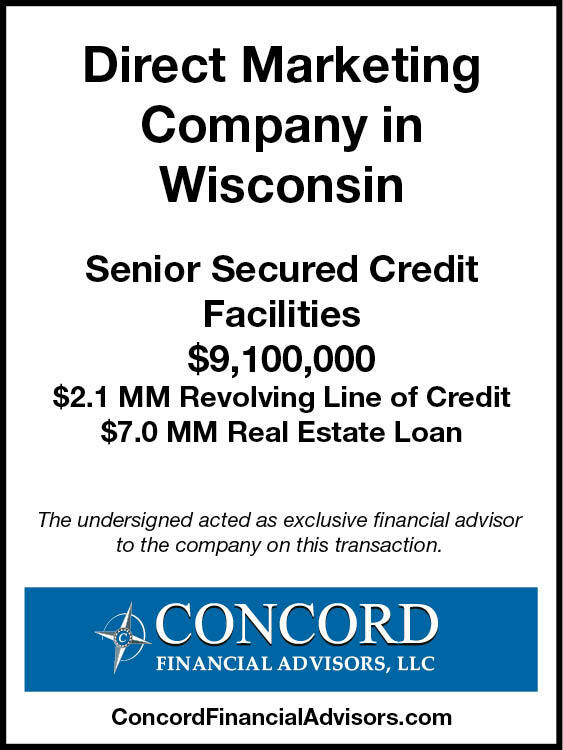 Concord quickly identified the most appropriate senior lenders for the Company and prepared a detailed memorandum highlighting the Company’s high quality experienced and specialized management teams, long term customer relationships and leadership in certain market niches. Concord conducted a targeted and efficient deal process with regional and national banks along with several real estate lenders. Concord procured the most appropriate financing for the Company with a pair of local community banks that provided a revolving credit facility and a real estate mortgage without utilizing the SBA, saving the Company a significant amount of time and money. The Company’s owners were impressed with Concord’s proven process, the resulting financing structure and the attractive economics of the transaction.